Sporadic errors cost valuable time during the development of new products. Debugging protocol-based buses is especially difficult and time-consuming because the communications pauses between the individual data packets can be very long. 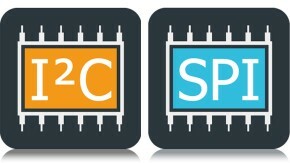 For example, a sensor will send a value over an I2C bus only once per minute. 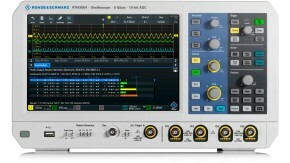 The oscilloscope memory typically limits the record length for analyzing errors and their history to a few milliseconds. A deep, segmented memory combined with dedicated trigger conditions solves this problem by permitting the acquisition of relevant sequences without long pauses. Equipped the R&S®RTB-K15 and the R&S®RTM-K15 options, this is exactly what the R&S®RTB2000 and the R&S®RTM3000 oscilloscopes offer. 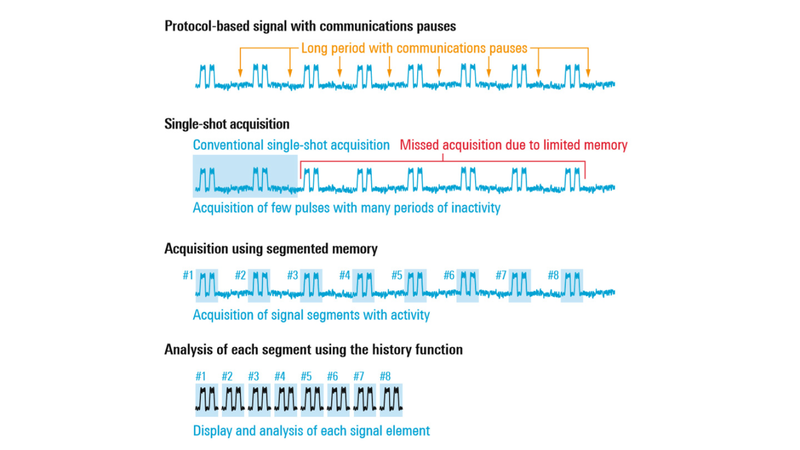 The R&S®RTA4000 oscilloscopes come with segmented memory as standard. Long data sequences are usually acquired in a seamless single shot. The maximum record length depends on the available memory and the selected sampling rate. With a maximum record length of only a few milliseconds, acquisition is often limited to a single protocol packet. During signal acquisition with segmented memory, the available memory is divided into segments, each with a defined number of samples. The user defines the length of the segments based on the maximum packet length in the signal. At the trigger point, the signal segment of interest is stored in memory along with the trigger timestamp. Time periods without activity are not acquired. If minimal blind time is needed, the fast segmented mode can be enabled. When this mode is activated, immediate postprocessing and display of the signal are suppressed, reducing the blind time between two acquisitions to a minimum. The acquired data is analyzed at a later time. Equipped with the R&S®RTB-K15 and the R&S®RTM-K15 options, the R&S®RTB2000 and the R&S®RTM3000 offer a history function with a segmented memory of 160/400 Msample per channel. The R&S®RTA4000 oscilloscopes provide a segmented memory of 1000 Msample per channel as standard. This is class-leading and covers analog and digital channels. The memory can be divided into several steps (see table). When the fast segmented mode is activated, the blind time is reduced down to5 μs. 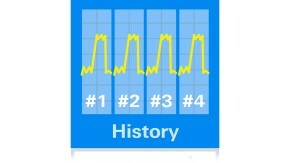 In history mode, all acquisitions can be analyzed at a later time. A highly precise timestamp permits precise time correlation of signal events. Individual marked segments can be selected in the acquisition table for display. Alternatively, the history function can be used to automatically play back all segments. All measurement tools, including the QuickMeas function, mask tests and protocol decoding, are available for analyzing the faulty segment. The I²C signal in the figure shows protocol packets approximately 100 μs in length. These protocol packets are interrupted by communications pauses of one minute. Activating the R&S®RTx-K1 protocol decoding option quickly shows that a segment length of 10 ksample (83.3 Msample/s sampling rate) is sufficient for reliably decoding and detecting typical signal faults. The user sets this value, and the option automatically calculates how many segments are available. In the example, there are approximately 35 000 segments, which corresponds to a maximum record length of 24 days. 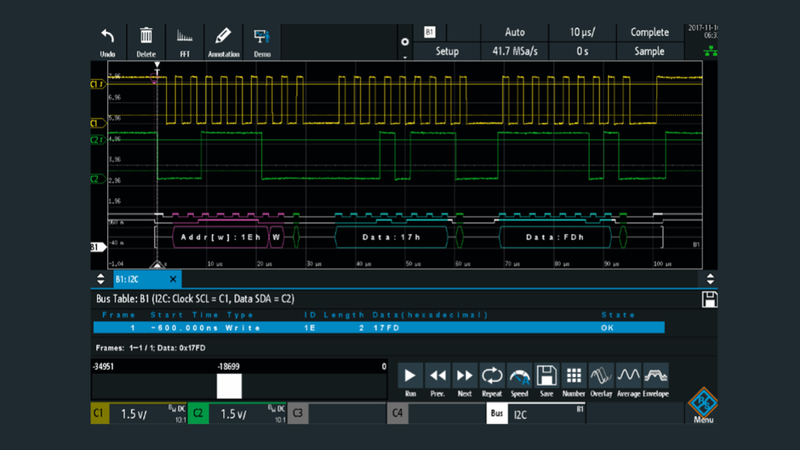 Decoded I²C signal with analog waveforms on the R&S®RTM3000. Previous acquisitions can be accessed by pressing the history function button – both during or after the acquisition. Standard mask tests and the navigation options provided by the history function help users to quickly identify signal faults and their causes. In the example, a glitch in the system clock signal several packets before the faulty packet was the key to identifying the cause of the error. The timestamp shows that the error occurred periodically (always in the morning). Systematic tests confirmed that inadequate shielding on the line caused it to pick up a pulse generated when the lab's fluorescent lights were switched on. The problem was solved by improving the shielding.